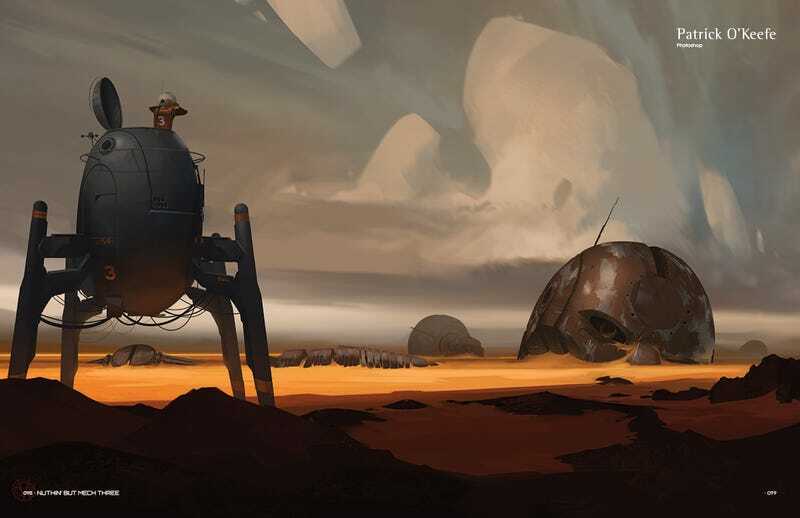 There have been a LOT of collections of robot, mech and cyborg concept art lately—but the Nuthin’ But Mech blog, and the books it’s spawned, are some of the best. The third Nuthin’ But Mech book is out, and we’ve got a huge, eye-popping gallery of concept art, exclusively at io9! Nuthin’ But Mech describes itself as the home of “ post-apocalyptic environments, futuristic vehicles, and sophisticated robots of all sizes and personalities.” And this third book features the most contributors of any of them—54 artists, in total. The artists in the book include “Chris Stoski (Sketchpad, Hugo, Star Trek, Star Wars), Emmanual Shiu (The Amazing Spider-Man 2, Superman Returns), Chris Rosewarne (Dark Shadows, Skyfall), James Paick (Scribble Pad Studios), and NBM founder Lorin Wood (Gearbox Studios).” And this volume is dedicated to past contributor Francis Tsai, who died earlier this year of Lou Gehrig’s Disease—some of the proceeds from the book will go to Tsai’s family. The book includes two of his pieces that were created using eye-tracking software. So check out a huge selection of images from the book—and don’t forget to click the magnifying glass to embiggen them! And here’s the book cover!